Eric Harden is the only NCO in the RAMC to date to be awarded the Victoria Cross, and the only VC winner in the RAMC from the Second World War. This slim volume is written by Harden’s daughter, a biography of the father she never knew. Initially in a reserved occupation as a butcher when war broke out, and frustrated with his passive role, Eric argued with his wife about joining up and ended up doing so in secret. He initially joined the Royal Artillery in April 1942 but transferred to RAMC a couple of months later due to his experience with the St John’s Ambulance Brigade. It seems that Eric had a thirst for action – he applied to join the Parachute Regiment but was turned down. However he was posted to 45 Commando and undertook gruelling training in a variety of locations. Eric landed on Sword beach on D-Day and his letters home betray the intensity of the fighting, and from the letters the effect it had on him was obvious to his wife. He was awarded his VC for the action that cost him his life, in Holland during Operation Blackcock. On 23rd January 1945 at Montfortbeek he went out a number of times to help the wounded, regardless of his own safety. He was wounded once and then killed by a bullet to the head later, believed to have been fired by a German sniper. The award of his VC changed the family’s life, but of course nothing could compensate them for the loss of a husband and father. In writing the book his daughter sought out former comrades and formed close bonds with them as well as the people of Holland who regard him as a hero. 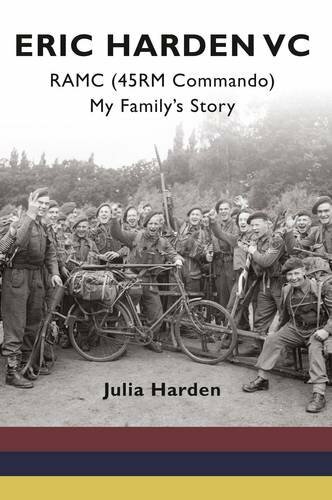 This is much a personal tribute by a daughter who never knew her father as it is a biography, and the overall impression that is given is of a man who loved his family, always put his fellow soldiers before himself, and never complained however arduous the task in hand.